Collingwood midfielder Daniel Wells will have surgery this week for a foot injury he suffered in the second quarter of Monday’s match against Melbourne at the MCG. 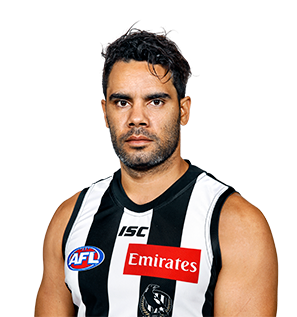 Daniel Wells will make his first appearance of 2018 when he joins Collingwood’s VFL team in a practice match against Box Hill at the Holden Centre on Friday. Will Wells play this week? 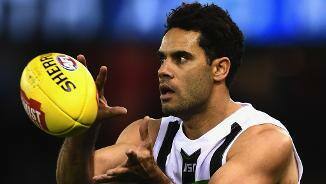 Collingwood still has a "query" on Daniel Wells' availability for Sunday's match against Port Adelaide. Wells’ glittering career took an unexpected turn at the end of 2016 when he made his way to the Holden Centre as a free agent. It came at the conclusion of one of his finest seasons, collecting 12 Brownlow votes across 19 games in North Melbourne colours. It was a bold statement from the then 31-year-old who had managed just two games the previous year due to injury. Wells struggled for continuity during his first year at Collingwood, but when fit, there were few better players. Just ask the Adelaide players and coaches who were on the receiving end of a spellbinding performance in round 19. Wells’ career includes two North Melbourne best-and-fairests, a Rising Star nomination and the 2004 Goal of the Year, when he stole a ball out of a ruck contest and kicked a goal all in the one motion. The boom recruit of the off-season was forced to wait until ANZAC Day to make his first appearance. While he didn’t disappoint in his 10 senior games, Wells’ brilliance at age 32 left Collingwood supporters keen for more. Soft tissue concerns limited his output during the pre-season, and meant he had to work his way through the VFL before making his senior debut. But once he did, his class rose to the fore. That the Magpies lost only two of Wells’ ten games says enough about his influence, underlined by a best on ground performance in the draw with Adelaide in round 19. That match was perhaps the finest of Wells’ 253-game career, including 34 disposals, six inside 50s, two goal assists and three majors of his own. While his body did not allow him to contribute for longer than he would have liked, Wells’ best football remains comparable with the game’s elite. Should his legs hold firm, Wells will have a big say on how far Collingwood goes in 2018. Rebounded from an injury-riddled 2015 to put together one of his best seasons yet. Wells managed 19 of a possible 23 games, polling 12 Brownlow votes and averaging 23.1 disposals, his best return since 2011. He shone with 29 disposals and three goals against Richmond in round 11 and put the Magpies to the sword with 29 disposals and several goal assists in round 19. Few realised Wells was moments from being withdrawn from the match owing to injury. He bowed out with 29 disposals in North’s Elimination Final loss to Adelaide, capping off a 243-game career at Arden Street that began back in 2003. 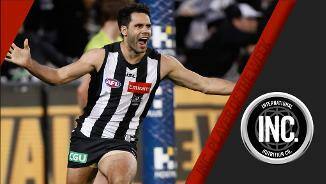 He then crossed to Collingwood as a free agent in October. Has had a wretched run over the past two seasons, with a foot injury limiting him to 10 games in 2014 and achilles tendinitis sidelining him for all bar two senior matches last season. Wells turned 31 in February and will be anxious to return to fitness and from before his contract expires at the end of this season. The Roos will be just as anxious to welcome his speed and class back into the senior team. Wells’ 2014 season was decimated by injury, with the star midfielder sidelined by a foot injury for 14 games after the Roos’ round five loss to Collingwood. He made a timely return ahead of the finals and quickly hit top form, starring in the Roos’ elimination final win over Essendon with 28 possessions. His class and run make him an invaluable player and often earn him an opposition tag. Started pre-season training early at North’s scaled-back Utah training camp in November in a bid to fast-track his 2015 preparation. Wells enjoyed another outstanding season in 2013, with a career-best streak of form in the final six rounds catapulting him into a tie for North’s best and fairest with Scott Thompson. Averaged 21.3 possessions a game and led the Roos in inside 50s (14th in the AFL). He kicked a career-high 25 goals – seven more than his next best year, 2011 – and twice booted four in a game – in round 19 against Geelong and round 21 against Essendon. With his speed and cat-like agility, Wells can cut opposition teams apart with his run and penetrating foot skills. Re-signed last February to the end of 2016 and captained the Australian team in last October’s International Rules Series. Remarkably won a race against time to take the field in round one, despite having to avoid all contact training during the 2012 pre-season as he recovered from blood clots. North’s most damaging midfielder starred in that game against the Bombers and then compiled another consistent season before missing the last three round with a calf injury. Was rushed back for the elimination final against West Coast but understandably struggled. Led the Roos in kicks, inside 50s and goal assists and averaged 21 possessions a game. Comes out of contract at the end of 2013 and the club will presumably be keen to re-sign him early this season. Wells silenced his critics with a stellar season last year that saw him win his first best and fairest (in a tie with Andrew Swallow). His trademark run and flair was again on display, but he added a tougher inside edge, finishing second at North for clearances (94). He also displayed the consistent form that had eluded in the past, averaging 23.4 possessions a game and finishing equal 10th in the AFL of inside 50s (101 in the home and away seas. Late in the year, Wells courageously with a life-threatening blood clot on his lungs, which only discovered after he had post-season shoulder surgery. He was subsequently put on blood thinning medication for the next six months and could not take part in the Roos’ high-altitude camp in Utah or competitive training until March. Nonetheless, he was aiming to play in round one. Rebounded strongly after an injury plagued 2009 season to last year remind the football world of how much he can hurt opposition sides with his run and silky skills. Alternating between half-back and the midfield, Wells averaged almost 21 possessions a game, kicked 15 goals and finished equal fifth at North for goal assists (10). Finished fifth in the best and fairest despite missing three games with injury. In a massive boost for the Roos, re-signed last September for the next three seasons. Hip and groin injuries cruelled the classy midfielder’s 2009 season, restricting him to just seven games, and none after round 11. His match-winning 26-possession effort against the Power in round seven underlined just how much the Roos missed him. Had post-season groin surgery in a bid to return to full fitness by the start of the 2010 season. Wells had another solid year in 2008, finishing sixth in the best and fairest, but again failed to take the step up from very good player to match-winner. Was particularly good in the second half of the season – from rounds 13-21 he had fewer than 25 disposals just once – but needs to work harder when tagged to ensure he is not taken out of games. Potentially the Kangaroos’ most damaging midfielder, Wells is a team-orientated player, who has been urged by his coach to be more selfish and use his pace to take on the opposition. Had a good 2007 – with his game in the finals win against Hawthorn the highlight – but the Roos will look to him to become a consistent match-winner in 2008. Equal second in the 2006 best and fairest, he is a proven match-winner. An exciting talent who can swing a game with his brilliance, often in short bursts. Has a great ability to bring his teammates into the game and now, entering his fifth season, needs to step up to become an elite player. One of the most exciting young footballers in the competition, he has lived up to all the hype that accompanied him being the No. 2 selection at the 2002 National AFL Draft. Again was one of the Roos’ prime-movers in 2005 and averaged 18 possessions a game. Missed just one game (through illness) and his pace, ball-handling and ability to bring teammates into the play mark him as a future champion. One of the most exciting young footballers in the competition, he has lived up to all the hype that accompanied him being the No. 2 selection at the 2002 National AFL Draft. Followed up a superb debut season with an even better one in 2004. Kicked the goal of the year with a remarkable effort against Fremantle in round 15 and a late goal against Carlton at the MCG in round three clinched the points for the Roos. Exquisitely skilled, he had 33 possessions against Hawthorn in round 17. Was fourth in the best and fairest. The sublimely skilled former Peel Thunder star lived up to all the hype that accompanied him being the No. 2 selection in the 2002 National AFL Draft by playing 18 games, kicking 10 goals and averaging 12 disposals a game. Earned an AFL Rising Star nomination in what is almost certain to be the first of many impressive seasons. The Kangaroos’ first pick, No. 2 overall, in the 2002 National AFL Draft, the former peel Thunder (WA) youngster is a hugely talented midfielder/forward with explosive pace, brilliant evasive skills, uncanny goal sense and football smarts. Finished runner-up in the Sandover Medal, captained Australia in an International Rules Series match against Ireland at under-17 level and was in the top five at the National AFL Draft Camp in agility, beep test, 3km time trial and speed.